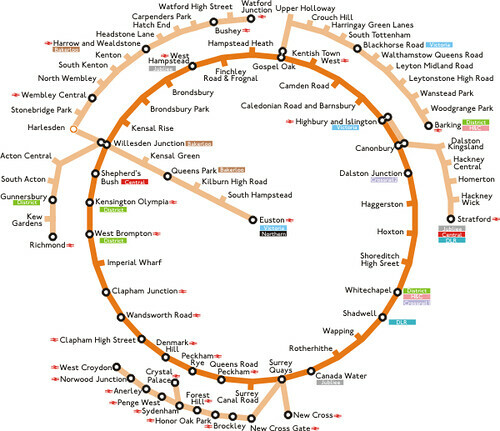 Ever wanted to see what the London Overground will eventually look like when all of the extensions are complete? Thanks to Nigel Doran (Nigello on Twitter), who found a great map of the concentric circles. Click on this page and you'll see the map in various stages (well, current & new). I'm guessing that TfL will never show the lines in this way, which is a pity, as it would make a lot more sense of the orbital railway and links with the London Underground. Who's for a massive Circle Line party, when it's all finished? 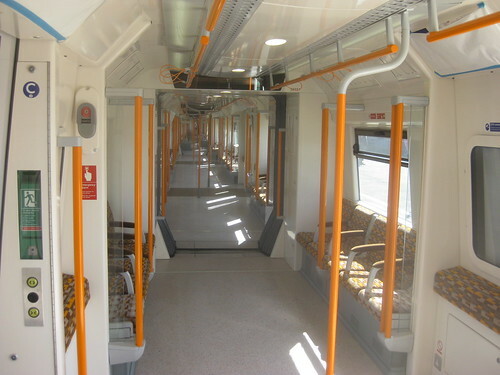 After a few false starts with a soft launch, a section of the new East London Line will be opening to the public today. Boris Johnson will cut the ribbons, or whatever, in an opening ceremony at Dalston Junction station and travel on a special service this morning. Then commuters can travel between Dalston Junction and New Cross from 12.05. The line cost £1 billion but opened ahead of schedule. 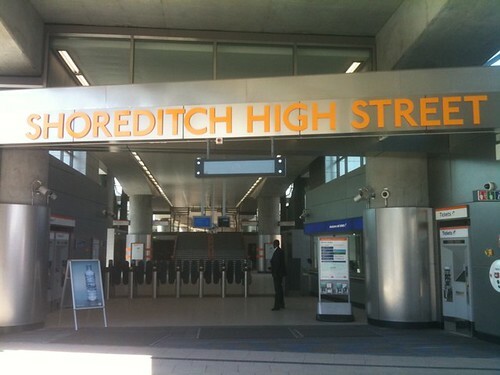 I'm sure lots of people will be heading over to the East End today to be the first travel on the shiny new trains and visit the brand new stations: Shoreditch High Street, Hoxton, Haggerston & Dalston Junction. For now trains will be running between New Cross Gate and Dalston Junction, Mondays - Fridays only. There will be no early morning or late night services, with a 7am - 8pm pattern. The full service is due to open on May 23rd. Once it's fully up & running, Transport for London estimate that around 100,000 people to use the service daily. Look out for blog posts from IanVisits (pictures here), London Reconnections, Londonist and Lewminesce who I'm sure will be some of the first travelling on the trains today. I might even try to make a short journey myself, it'll be change from travelling on the London Underground. "The only people scoring political points were a cabal of Ken Livingstone acolytes grouped outside on Dalston Lane, clutching banners that hailed the East London line as a project completed through Labour investment. It's a fair point, and Boris' performance for the cameras conceals the fact that London Overground is a project that Ken pushed through." 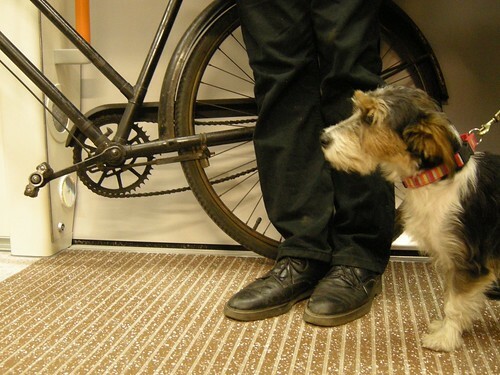 UPDATE: Martin Deutsch was on the first public East London Line train and took some pictures of the crowded line, along with the first dog & first bicycle to travel on it! 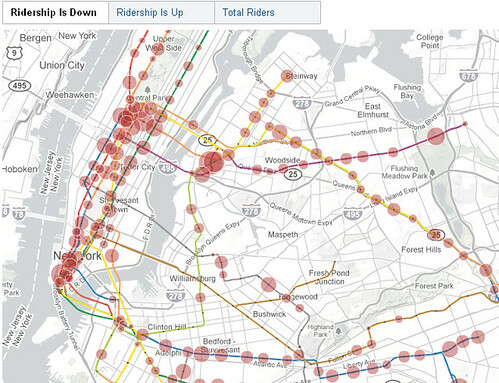 Interesting use of Google maps in New York, where figures showing subway ridership have been mapped onto each station. In all, the system had 1.58 billion rides last year, officials said, this meant a decline of 2.7 percent from 2008. The New York Times puts most of the decline down to job losses. Hat tip to MichalD for the link. Wonder what a map of the London Underground would look like on this basis? Have you noticed fewer people at the Tube stations you use regularly? Should there be a toast ban for London Underground staff? Jo deBank of passenger group London TravelWatch wonders whether it should be a possibility as King's Cross Tube station was twice evacuated and closed for 20 minutes due to fire alerts caused by burnt toast. "This might sound minor but to shut such a busy station — which disrupts the journeys of thousands of passengers — is serious", she said. The Evening Standard report that "firefighters were called to the station after smoke began billowing from singed bread left unattended in a toaster — once at 8am breakfast time and the other at 6pm tea time." This was confirmed by a TfL spokesperson who said closures on March 13th and April 7th were caused by "smoke from a toaster in the staff area of the station. London Underground has extensive heat and smoke detection systems, fire alarms and sprinkler systems and both alerts were dealt with quickly." Apparently, burnt food in staff kitchen also led to a closure at Caledonian Road Tube station on the Piccadilly line earlier this year. The official report concluded: "Upon inspection of room found the cause of smoke, someone had decided it was a good idea to store their box of Rice Krispies and four custard cream biscuits in the oven." Perhaps there ought to be a new kitchen Inspector just for these incidents, like Inspector Sands who is called for when a fire alarm has been set off. If you hear "Could Inspector Ramsey or Inspector Oliver make his way to the control room", you'll know that settings on the staff toaster need adjusting. 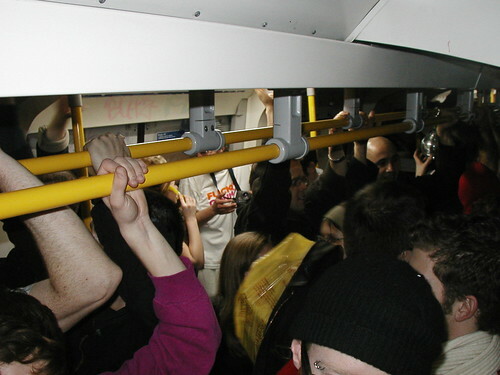 Want to get together with someone on public transport? Surprise, surprise, there's an app for that. Likeu which could be useful for the London Underground. Now that the London Lite's gone, taking with it the "Love Bites" small ads. The app's described as the equivalent of sending a mate over to speak to a cute stranger. "Try and ask a question that requires more than a 'yes' or 'no' answer. Don't ask "does this train stop at Victoria?" as they can simply say "yes", and end the conversation. Instead, ask an "open question" like "how do you get to Victoria?" as they will have to reply with a more detailed answer which will help you get a conversation going. However, do expect them to look surprised that you've spoken up, and be prepared to repeat the question if they are startled. If they're genuinely interested in you they will be happy to start chatting. You'll be able to tell if they are not interested. If it is going badly, and you feel embarrassed, just get off at the next stop!" 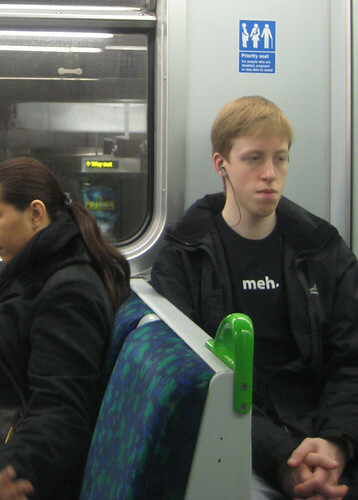 And remember "too much smiling on the Tube can look odd, so be careful not to overdo it." 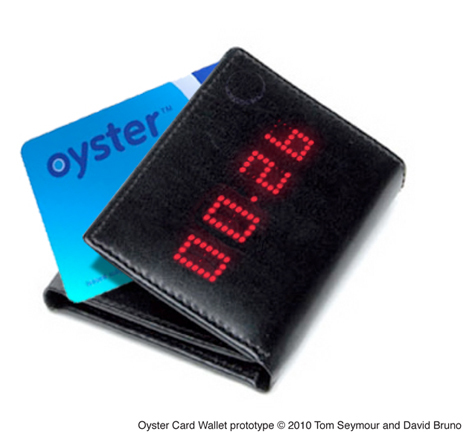 If you need a quick reminder on how much credit you've got left on your Oyster card, this prototype wallet could come in use. Designers Tom Seymour and David Bruno said "With the Oyster Card Wallet you’ll know how much credit you have on your card at all times, at a glance. So no more waiting for the bus only to be turned away, and no more walking into the Tube gates and holding everyone else up. It's a simple idea that will help the London Underground work a little more efficiently." It is a remarkably simple concept and I'd be interested to see if it makes it into production. Although as some people on Twitter have said, it might make it easier for pickpockets to tell which cards are worth stealing. That's assuming the pickpockets have great eyesight! Perhaps putting the display on an inside flap in the holder would help - although it wouldn't look as cool. Hat tip to @LDN and hjd1984 for finding this. There's a Facebook page for people who want to find out more about this and help the designers get the concept off the ground. If you're one of the people who enjoys playing Foursquare, you could be interested in a new location based game about travelling on the London Underground, launching late this year. Chromaroma was presented at City Hall this morning at seminar on The Possibilities of Real Time Data. "Chromaroma is a type of location-based top-trumps. You collect places, identities, modes of transport and passengers as you travel around the city; discover and investigate mysteries attached to different locations and build alliances with fellow passengers that share your journeys." It'll be interesting to see what type of "alliances" will be built and might show commuters being a lot more friendly in a gaming environment than in the flesh! Although we might find the opposite to be the case. Moody commuters might find this an opportunity to virtually fight people in a race to be King of Cockfosters, for example. There was some discussion over privacy aspects in the presentation at City Hall. The game currently scrapes journey history data from pay-as-you-go Oyster users who've already subscribed to the game. Have we created a stalking app and unleashed a litigious monster?" he producers Mudlark ask on their blog. Do the privacy aspects worry you, or do you think you could tactically use them to your advantage? To build up effective gameplay is it essential that people can see the travel strategies of competing players - otherwise it's like hiding chess pieces! As the game is still in development, the guys behind Chromaroma would be interested in whether you'd actually play this. Would it make you more aware of the time you spend walking or using public transport? Would it benefit how you used the Tube, or do you just see it as a game? 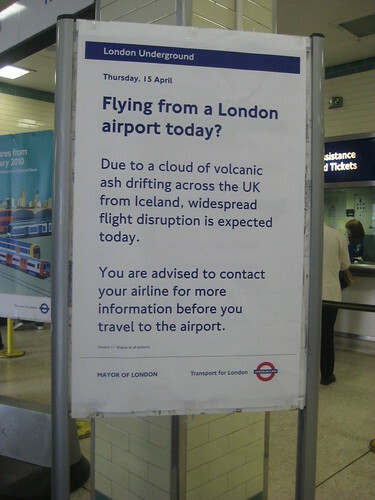 Kudos to London Underground for going for the slightly more dramatic way of announcing that there were disruptions to flights due to volcanic ash from Iceland. I like the use of "drifting" that's almost poetic for the Tube. Although not as dramatic as the headline on Metro's Independence Day style "The day the skies stood still" front page today! Interesting how National Express decided to include the British Airport Authority in this notice, probably to give it more strength. Good luck if you planning on flying from the UK in the next day or so. Thanks to MetroTwin for interviewing me for their blog. 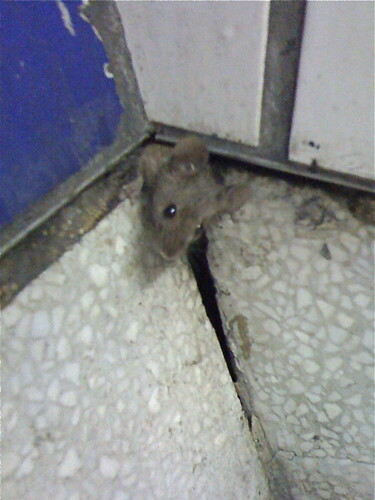 They found a fantastic picture of a mouse on the London Underground from Dan's Photos. Try as I might, I've never been able to get a picture of a rodent on the Tube, as the little blighters are always too fast for me. Check out the interview if you want to see where I think the best places to spot Tube mice are & other stuff about grapes, suicides and Hitchcock! 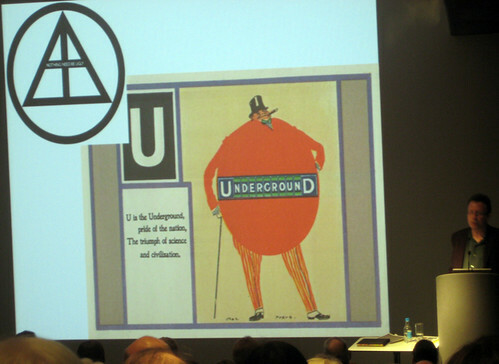 Last night I went to the London Transport Museum's talk by Oliver Green on Frank Pick & Ambrose Heal. Both great proponents of design in the 1930's I was intrigued to see what links there would be between the London Underground's Managing Director and the chairman of one of London's best known furniture store. A major concern was they both believed that objects, be they furniture, trains, posters or shops, shouldn't just be produced quickly, but had to look good – nothing need be ugly, was the slogan of the design association (the DIA) they were both founders of. I'm going to focus mostly on the things about Frank Pick I learnt (it's an Underground blog so no surprise on my focus), but the narrative behind Ambrose Heal was just as interesting. Pick's London Underground was on the verge of bankruptcy when he joined in 1912. There were not enough passengers to pay for the vast investment that had been put into the system - "Sounds familiar" - Green joked, so Pick's initial task was to get people to think about using the Tube more often. Posters were the best way at the time to do this & passengers numbers grew under his management. Here you can see a slide with posters promoting the London Underground as way to get directly to the seaside. If you picked up the District Line from Ealing Broadway you could take a train to Southend on the Essex coast. Only the other day I saw a quiz asking for the nearest Tube station to the seaside – funny to think that in the days you could get to coast by Tube more people would have known what it was! In the 1920's the London Underground was the most progressive transport system in the world. "Light years ahead of mainline railways, Pick ensured the new stations followed radically new designs", said Green. Pick developed these with Charles Holden (another member of the DIA) and they concentrated on easing passenger flow & were much influenced by Dutch & Scandinavian architecture. You can see the large amount of glass that was characteristic of Holden's work at Sudbury Town which opened in 1931. It's difficult to see from this picture, but at the back of the station was a poster aimed at "British Children" and encouraged them to go to a toy exhibition in Charing Cross Tube station. Pick made sure there was a regular exhibition at Charing Cross, usually with a design bias. 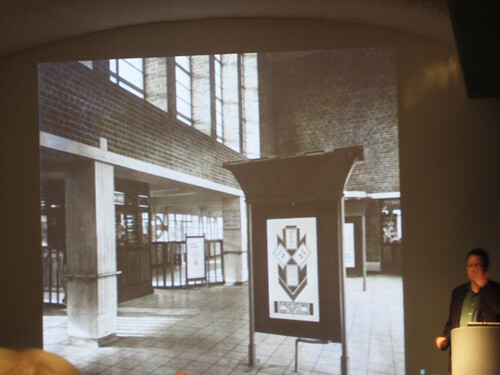 It was interesting to learn that Arnos Grove station was a scaled down version of the new city library in Stockholm. Although Pick was responsible for radically transforming the London Underground's design he never received any plaudits or honours for his work. Well, at least not from London. Pick was however recognised with an award by Stalin for his consultancy help with the Moscow Metro in 1932. We were shown this amazing picture above where Pick & other London Underground bigwigs were invited over to Germany in 1935 to attend a concert celebrating the centenary of the German railways. "Here's another organisation pretty good at corporate identity", said Green as he pointed out the Nazis on the right side of the room, with the "foreign guests" on the left. Hitler and Göring are in that picture too. Even at the outbreak of the war Pick was still encouraging people to use the Tube to get to the countryside. A popular poster had the headline "Don't worry about the Germans invading the country, do it yourself by Underground". Around this time he commissioned a children's booklet as a fundraiser for the troops, called The Underground Alphabet. Green highlighted the rather jolly U for Underground (the first picture in this post). It would have been interesting to see Pick's influence throughout the Second World War, but unfortunately he didn't live to see the end of the war. He survived a near miss when a neighbour's house was bombed. But left the Underground in 1940 – effectively forced to take early retirement caused by ill health through working too hard. Sadly he died the year after. Green believes the Jubilee Line Extension in the 1990's saw a return to Pick's design values. 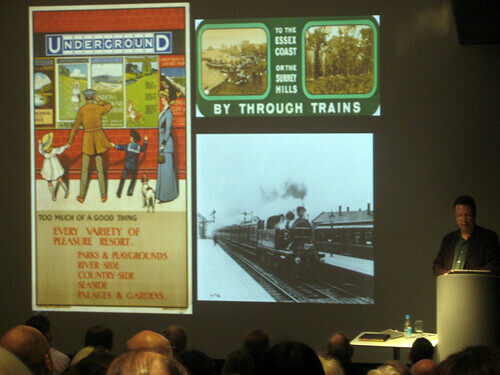 I think the whole audience was pleased to hear the London Transport Musuem are considering a permanent tribute, to honour his work in the next few years. Although as Green says like Sir Christopher Wren, his legacy is all around us on the Tube we see today. 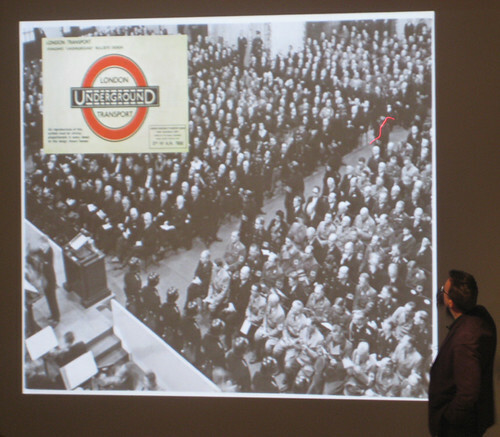 Look out for Oliver Green's next talk on the 11th May which celebrates the 75th anniversary of the Moscow Metro. Anyone trying to look at the Transport for London website last night would have found themselves being entertained by our feline friends. 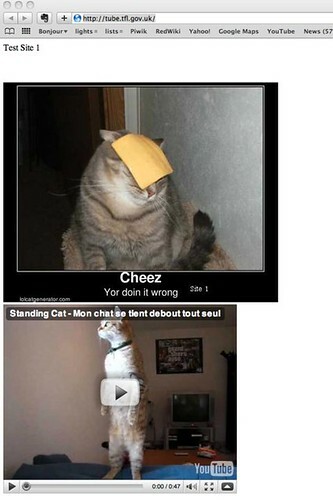 It looks like a webmaster was playing around with the URL http://tube.tfl.gov.uk/ and for some reason thought it would look good with cats. This was live from about 8.30 last night for around two hours. The link normally goes to main London Underground website and within seconds, hundreds of people were taking screengrabs & Tweeting as they couldn't believe cats had invaded the Tube! Ben Smith said "Although it looks like a test site (the main TFL site doesn't link to it) I vote all TFL sites should be like this." Benjamin Ellis, who took the screengrab above said "I saw hundreds of people mention it, probably got more page views than the normal TfL site ;)"
Maybe the Tube is run by fat cats after all! 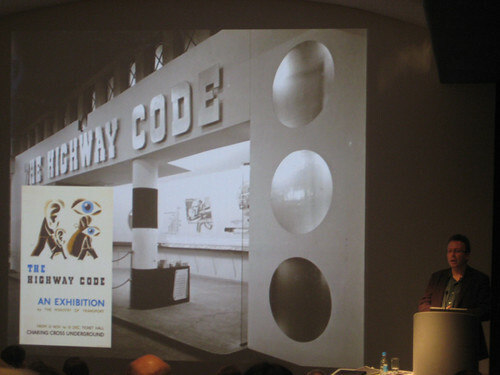 On Tuesday 13th April 2010 the London Transport Museum will be celebrating two design heroes from the early 20th century in an illustrated talk. The hour long talk, "From the sublime to the ubiquitous" will be given by Oliver Green. It will focus on Frank Pick, the chief executive of London Transport in the 1930's and Ambrose Heal, who founded Heal's furniture store. Both were founder members of the Design and Industries Association & talk will explore how each applied the DIA's slogan "Nothing need be ugly" to all aspects of their work. Green argues how this slogan went well beyond the promotion of their own companies and encouraged a new appreciation of the importance of design in everyday life. 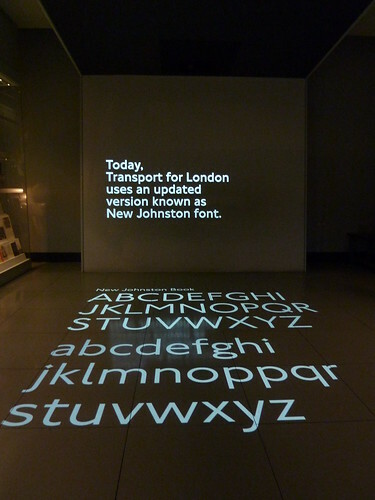 Frank Pick was given responsibility for London Underground's publicity in 1908 and commissioned its famous Johnston font. He asked Johnston for a font with 'the bold simplicity of the authentic lettering of the finest periods' while 'belonging unmistakably to the 20th century'. Oliver Green's always a great speaker (I last saw him at the Transformed by Tube night) and this should be an interesting presentation. Tickets can be bought in advance here or reserved by calling 020 7565 7298. It starts at 18.30 at the London Transport Museum at Covent Garden Piazza and admissions charges are: Adults £8.00; senior citizens £6.00; students £4.00. UPDATE - The London Transport Museum have very kindly offered a free pair of tickets for the talk. Just email me or leave your answer in the comments or @AnnieMole me on Twitter with the name of the nearest Tube station to Heal's flagship store on Tottenham Court Road. We'll announce the winner on Monday! Sometimes there's something about the daily London Underground commute that can only be expressed in one word. I think this T-shirt, spotted this morning, says it all. If I'd have been one of those over jolly people who always insist on telling people to "Cheer up, it might never happen", I would have done. Although I get this feeling this guy might have said "It already has". 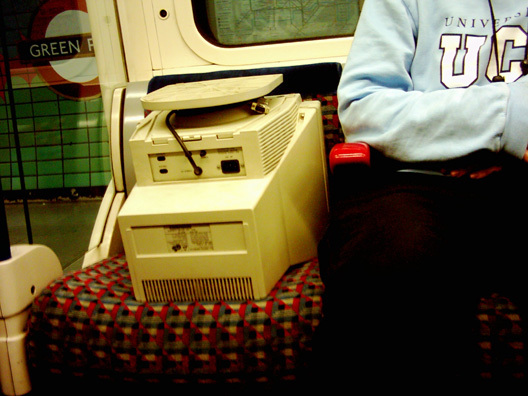 If you were one of the people delayed by yesterday's Circle Line closure put it down to 1980's computer "burn out". 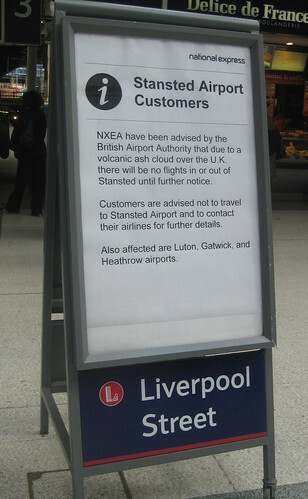 A London Underground spokeperson blamed "antiquated assets" for the most of the line being suspended throughout the day. An IT error led to the signal problems, although this morning's signal failures were unrelated to "Back to the Future" style computers. TfL told IT Pro "Our engineers worked through the night to repair the problems which caused yesterday's suspension but a new problem developed this morning. "The bottom line is that it's exactly these kind of antiquated assets that we're seeking to replace with the upgrade programme we’re carrying out at the moment." In January it was announced that SAP-based TfL is preparing to sign an extensive range of framework agreements, totalling a potential £70 million and covering IT services. I'm not techie enough to know how much of this will be signal related, but hopefully with a 70 million quid investment we might be lucky for the lines to see some computers that were made this century. London Reconnections are reporting that the new East London Line (ELL) is likely to be open for a period of limited passenger service referred to as a "live testing operation" from 15th April 2010. "During this period, services will run between New Cross Gate and Dalston Junction, Mondays - Fridays only. There will be no early morning or late night services, with a 7am - 8pm pattern (or thereabouts) running. Full evening and weekend services will begin on the official opening date." The full service is due to open on May 23rd. Once it's fully up & running, Transport for London estimate that around 100,000 people to use the service daily. As the line offers a link between parts of London that have long needed good transport connections, it should be a success. 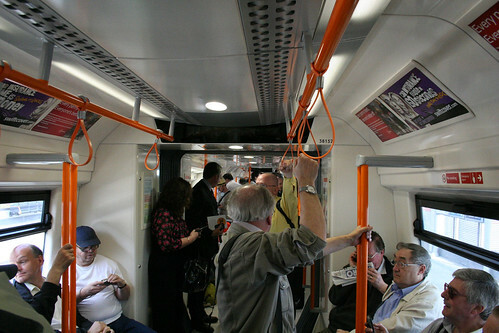 One of the more important questions, is posed by Londonist: "It does, however, pose a significant hazard to pub quiz-masters and London Underground trivia hounds: should London Overground be counted as a proper Tube line or not?" More crucially, will it be included in the Tube challenges, where people try to visit every station on the network in the shortest possible time? Circle Line cooled by Large Hadron Collider? According to the Independent the London Underground have been approached by particle physicists to install supercooled magnets and collision detectors at strategic positions on the Circle Line. Cern believes it build a successor to the Large Hadron Collider within the Circle line by 2020. 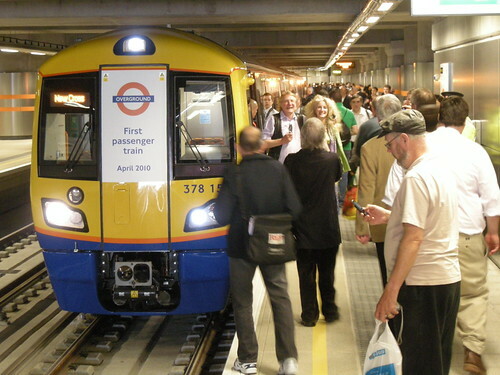 "Although there are still considerable technical problems to overcome, such as a geo-magnetic "kink" in the circuitry at Edgware Road station, Cern is quietly confident that it will be able to convince London Underground of the merits of the scheme, which should result in the first air-conditioned underground line as a spin-off of installing supercooled magnets below ground. The idea was initially mooted in the mid-1980s as an alternative site to the 27km tunnel below Geneva but the idea was dropped." Judge for yourself whether a Professor Lari Polof or Doctor Olaf Priol was involved in the discussions which "would mean that two beams of protons would be travelling in clockwise and counterclockwise directions at 99.999999 per cent of the speed of light, within feet of Circle line passengers stuck in perpetual immobility."